A while back, we shared some of the awesome projects the Innovation and Entrepreneurship students created as their final projects. Another one of the projects combined innovation and technology with learning and sustainability. The students called it Roll the Rot, a playful way to learn about composting and STEM. The compost bin would be used along with a curriculum to teach kids about composting. The dodecahedron (12-sided die, or D12) shape, would make it fun for kids to roll around to aerate the compost. When in the early prototyping stage, the students were able to prototype a small-scale model using the 3D printer. 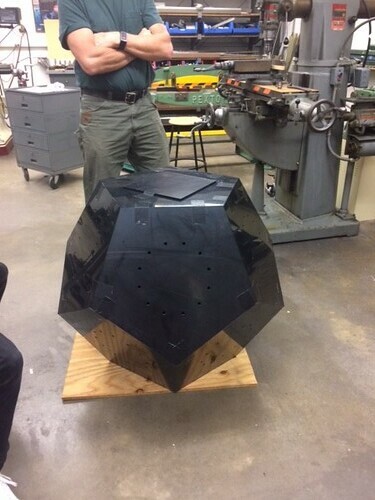 A large to-scale prototype was created with the help of a local plastics company. 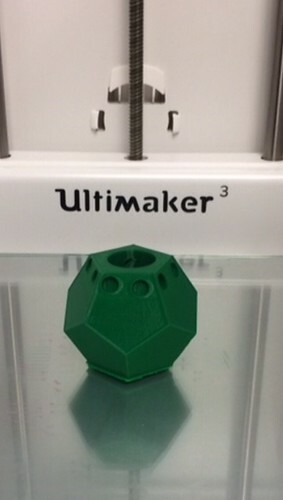 This entry was posted in 3D Printing, Assignments, Innovation & Entrepreneurship and tagged 3D Printing, entrepreneurship, innovation, sustainability, Ultimaker on April 2, 2018 by Angela Vanden Elzen. Students from the Innovation and Entrepreneurship course, In Pursuit of Innovation have spent a lot of time in the makerspace this term creating prototypes for some excellent products. The last project listed has even been made into a Kickstarter project! Be sure to check out the Green Plantern by AIRO. The effort and thought put into this project is very impressive. They hope to make indoor gardening more accessible through their compact aeroponics system.Their campaign runs until December 24, 2017. This entry was posted in 3D Printing, Assignments, Innovation & Entrepreneurship and tagged 3D Printing, academic library makerspace, entrepreneurship, innovation, Lawrence University, prototpying, sewing, Ultimaker on November 20, 2017 by Angela Vanden Elzen.